At Mid-City Precision we are able to work with a variety of materials including mild and tool steels, cast iron, stainless steel alloys and cast stainless steel, aluminum alloys, brass and bronze alloys, along with a variety of plastics. Our lathe department can do general turning and profiling, internal and external threading, knurling, and short bar feed operations. Our milling department offers full 4 Axis vertical mills and horizontal milling machines. This allows us to deal with a wide range of machining possibilities. From large to small parts, we can offer many options to fit your needs. We also offer a wide range of options to finish your parts. We work with local businesses to offer you services such as all types of plating, anodizing, heat treatment, honing and grinding. 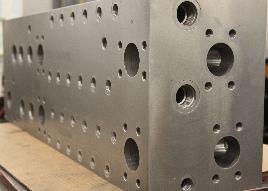 We also offer laser welding, broaching and splining. Pickup and delivery to the Minneapolis/St. Paul area is another service we offer at Mid-City Precision, Inc.